Italian food is a surprisingly diverse cuisine. Each of the twenty Italian regions has a distinctive set of flavors, recipes, products, and ingredients. In fact, the Italian regions were not officially united as a nation until the mid-19th century; therefore, each individual region has retained much of its exclusive identity. Climate and natural landscape have played a major role in shaping regional cuisines. Creamy risotto and other delicately flavored dishes predominate in the Northern regions, while bright olive oil and tomato-based recipes rule the sunny South. Beef is best enjoyed as Florentine steaks in Tuscany, from choice cattle raised in the Chianina Valley. The city of Alba and surrounding areas of the Piedmont region are a top source for expensive truffle mushrooms, particularly pungent white truffles. Access to both the Mediterranean and Adriatic Seas makes fresh seafood dominant, though varied, throughout the peninsula. Proximity to other countries and a history of militant invasions play a role in the uniqueness of regional cuisines as well. This explains the unprecedented popularity of sauerkraut and goulash in the Alpine regions of Trentino-Alto Adige/Südtirol and Friuli-Venezia Giulia. The culinary footprints of conquerors can be seen in the unexpected presence of Arabic spices and North African couscous in Sicily today. In fact, these conquerors are largely responsible for bringing such Italian staples as tomatoes and basil to flourish in the South. Such artisan products as wine, cured meat (salumi), and handcrafted cheese can be found throughout Italy. The style and flavor of these delicacies varies greatly according to region. Italy is one of the largest wine producers in the world with a broad span of both white and red varietals. Yet the Sangiovese varietal, originating in Tuscany, is arguably Italy’s winemaking claim to fame. Derived from the words “sanguis Jovis” or “blood of Jobe,” this red wine grape is the main grape in Chianti and Brunello wines. Cured meats, like the popular prosciuttos of the North and various salamis of the South, are used in such culturally significant dishes as the savory Easter pies made throughout Central and Southern Italy. Cheeses range from the soft, mild Buffalo Mozzarella of Campania to the hard, salty Pecorino Romano of Sardinia. These products often carry names indicative of their origins, such as the increasingly popular Grana Padano (a “grainy” cheese from the “Padana” or Po Valley of the Lombardy region). Location is so important to many Italian food products that laws exist to protect the authenticity of products made in a certain region. For example, any vinegar labeled Modena Balsamic vinegar must be crafted in the town of Modena, and any cheese labeled Parmigiano Reggiano must be produced in one of several provinces in Emilia-Romagna. 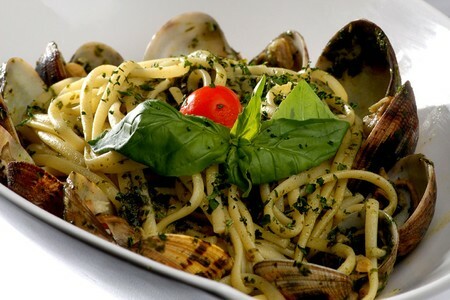 A wide regional assortment of wonderful breads and pastas can be found throughout Italy. Italian breads differ significantly in size, taste, and texture. The large, chewy ciabatta loaves of Lombardy’s Lake Como and the thin, crunchy grissini breadsticks of Turin are on opposite ends of the spectrum. Pasta is also unique from place to place. Fresh homemade pasta abounds throughout Italy and is often simply dressed, so as not to overwhelm its delicate flavor. Dried pasta is most popular in the South and can be adorned in countless inventive ways. Some say there are more pasta shapes in Italy than one person could conceivably eat in a lifetime. Italians have been known to squabble over the proper name and culinary use of a particular pasta shape. Some shapes have legends behind their creation, such as tortellini, from Emilia-Romagna. Legend has it that a lusty innkeeper in the city of Bologna invented this ring-shaped, stuffed pasta after peeping on the goddess Venus through a keyhole. With merely a glimpse of her bellybutton, he ran straight to the kitchen in a fit of passion to make this pasta in honor of her bewitching navel. Local cooks will still argue for hours over the proper name, preparation, and origin of particular dishes. Italian food is always a matter of regional pride. But if one were to try and sum up this diverse cuisine, Italian cooking can best be described as a celebration of local flavors held together by a singular appreciation of high-quality, seasonal ingredients, presented in elegant simplicity. Across all regions, Italian dishes are straightforward preparations of a few choice ingredients, which are artfully combined. Italy is unified by a national concept of classic meal structure. Rather than serving up everything in one or two courses, Italian dinners traditionally include an array of many small plates enjoyed in succession, giving diners an extended time to savor food and company. Meals progress from antipasto (appetizer), to a first course of pasta or other starches, a main dish of meat or fish with a simple side of vegetables, followed by salad, cheese and fruit, coffee, and possibly a digestive (like grappa or sambuca liquor). Contemporary city dwellers, who have largely abandoned this meal structure for convenience sake, often still follow it on holidays, when the long feast still prevails. Yet these time-consuming meals arguably inform the Italian understanding of food as a sensory bliss beyond mere nourishment. Dessert is sometimes served at the end of a special meal, but more often is enjoyed on its own as a midday snack. Characteristically, Italian dolci are restrained in terms of sweetness. Cookies, cakes, pastries, and tarts can be savored with coffee as a daytime energy boost. The ever-popular tiramisu literally means “pick me up” and is composed of sweetened mascarpone and Marsala with espresso-soaked lady fingers. One theory asserts that Northern Italian women created this caffeinated dessert to stimulate and fortify troops during World War I. Some sweets are more specific to holiday seasons, such as panettone, a buttery egg bread laced with dried fruit and candied citrus, eaten around Christmas. This famous Milanese treat is quite laborious to make, traditionally taking up to a week to complete. Gelato is a popular year-round dessert. This rich, intensely flavored Italian ice cream can be enjoyed anywhere at any time. The most exceptional Italian contribution to the field of pastry is probably the Piedmontese invention of gianduja (a sweet chocolate containing 50% hazelnut paste). Gianduja is used as an ingredient in innovative desserts throughout the world. It even inspired the creation of Nutella, one of Italy’s many popular food exports. Coffee, particularly espresso, enjoys widespread popularity and cultural significance throughout Italian cities. The vast range of espresso drinks served in Italian cafes has been mimicked in coffee houses throughout much of the world. Luigi Bezzera filed the first patent for cappuccino in 1901, deriving its name from this foamy drink’s resemblance to the brown and white hooded garments worn by Capuchin monks. Espresso was first developed in Milan in the early 20th century, although the modern espresso machine did not appear until the mid-1940s. Many people misunderstand the term espresso. Rather than referring to a specific style of coffee bean or roast, espresso is simply a thicker, concentrated extraction of coffee through a highly pressurized brewing process. The barista, responsible for preparing espresso drinks in cafes, is a highly regarded career position in Italy. Busy urbanites rely on local baristas for a delicious pick-me-up at various times of day. Street foods, such as gelato and panini sandwiches, are also popular in the hectic metropolitan cities. But no street food is as ubiquitous in Italy as pizza. Despite pizza’s global status, most international pizzas bear little resemblance to the thin, crunchy crusts invented in Naples. Served with only a minimal topping of garlic and herbs or fresh mozzarella and basil on sparsely smeared tomato sauce, this tasty, wood-fired bread has a distinctive flavor. The tomato sauce, garlic, herb variety, called Pizza Marinara, is said to be the oldest variety of pizza, and was named for a Neapolitan fisherman who often enjoyed this dish. Baker Raffaele Esposito created another variety, Pizza Margherita, in honor of Queen Margherita, using red sauce, white mozzarella, and green basil to represent the Italian flag. This queen, who could appreciate the splendor of workingman’s food, subsequently rose in the esteem of her people. A somewhat wider variety of pizzas can be found throughout Italy today. Nevertheless, the classic Naples pizza remains a perfect symbol of the beautiful simplicity intrinsic in Italian cuisine: the clever uncomplicated preparation of a few delicious ingredients to render a truly world-class dish that is at once humble and supremely epicurean.